Using a brown grocery bag and making “leather” for this project is the first step when making this American Indian papoose. The third graders in our school study the American Indians, so I thought this would be a fun project for them. It will take more than one one-hour class unless the “leather” is made before class. You’ll find the step-by-step instructions for this project, “American Indian Papoose,” in the 3rd Grade Projects Gallery in the sidebar. 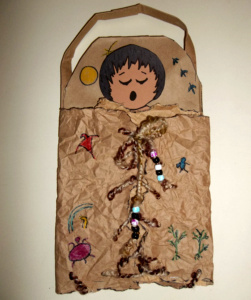 This entry was posted in Categories and tagged 3rd Grade, american indian, american indian papoose, art, arts and crafts, crafts for kids, Indian, indian art project, indian craft project, indian papoose, native american. Bookmark the permalink.